Boy am I excited to share this blog post with you all! 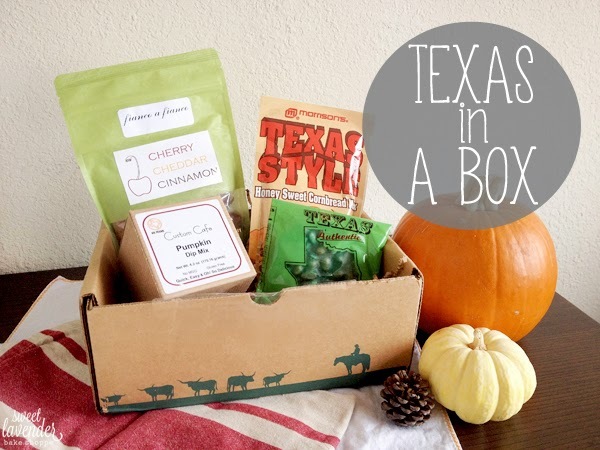 I recently got a super awesome package in the mail, from TX in a Box and holy cow did it make a fun mail day for me! You have the option of purchasing one month, 3 months, or 6 months of fun (you save over 34% with the 6 month subscription) which is neat because you choose the amount of time this subscription will last! 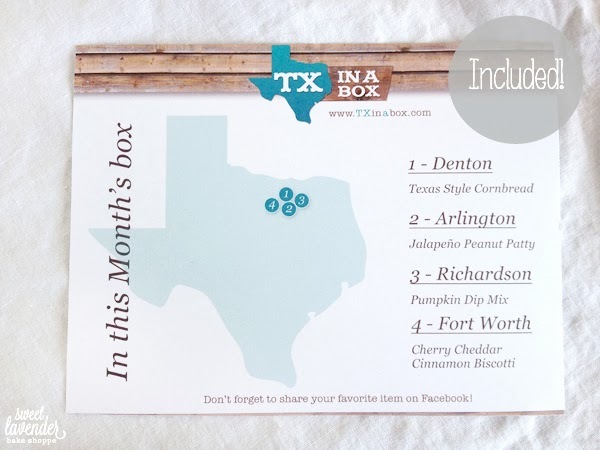 Again, totally seeing the one month box as an amazing gift idea! You'll see right on their homepage the option to gift it. So this lovely thang came to my doorstep, packaged all cute in it's brown box with green cowboy silhouettes on the side, and was ripped open (by me) in a matter of seconds. Helloooooo lovelies! 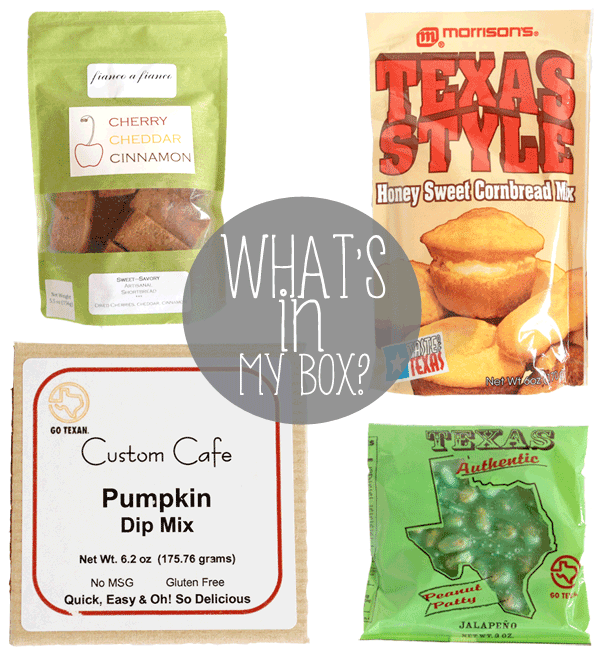 Here's what my specific and unique Texas in a Box contained! AND each box includes a little paper showing you exactly where every item comes from. So dang neat. I couldn't help but rip open the shortbread cookie package as soon as possible and munch away. Holy cow! Delicious! 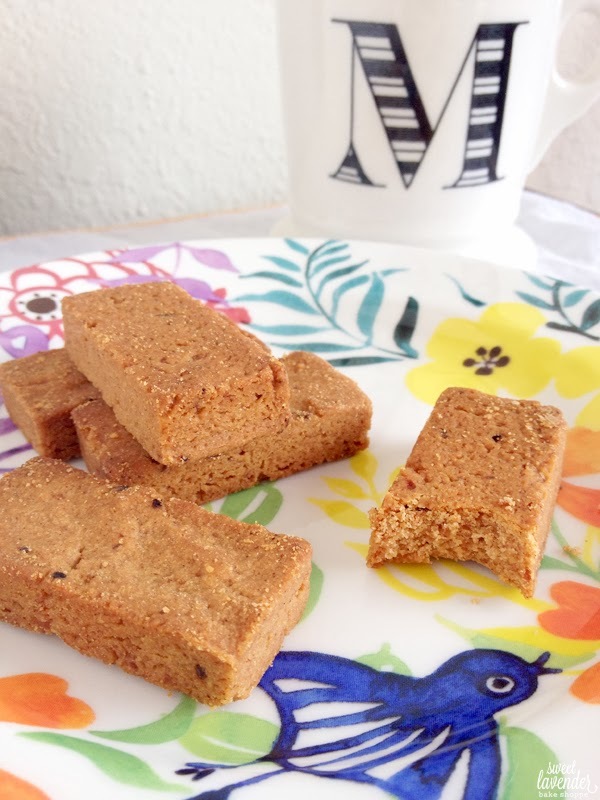 I would have never thought to combine the three ingredients into a cookie, but it totally works! And friends, guess what??? You can save $10 off your first order with this link here! Which means for a one month box subscription you only pay $19.00! It will be directly applied at checkout ;) Talk about an awesome Christmas gift, right?? Goodness gracious. It would be the gift that keeps on giving! 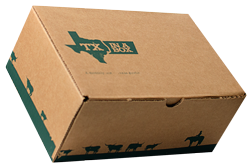 *TX in a Box provided me with a free sample of this product to review, and I was under no obligation to write a positive review in return for the free product. All pictures and opinions are indeed my own. Fun! Which edible goodness was your favorite? I love cornbread no matter where it comes from. Totally agree about the cookies, they were surprisingly good! Ok so I really really loved those cookies...but then this past weekend I made the pumpkin dip for my family...OHMYGOSH! So good! THAT was my favorite! This Texan totally wants to sign up!! Looks awesome!